Today we'll be talking to Lucy Newton. Lucy is also currently the service dog trainer for the American Humane's Pups to Patriots Program. This program trains dogs to be service dogs and pairs them with veterans coping with post-traumatic stress and traumatic brain injury. And she says that's the bulk of her work these days. Hi Lucy! Welcome to the podcast. Lucy Newton: Thank you for having me. Melissa Breau: Excited to chat today. To start us out, can you tell everybody a bit about the dogs you have and what you're working on with them? Lucy Newton: Like you mentioned in the intro and my bio, the service dog training has taken over quite a bit of my life, so the good news is it's still dog training, the bad news is, like everybody that is trying to juggle their own dogs and full-time work, my current dogs are coming out a little bit light on that. Melissa Breau: Totally understand that. Lucy Newton: They still get training, but it's probably not as organized and focused as it has been in the past. I have Indy, who a lot of people have seen in some of my class videos. She's a little Dutch Shepherd and I'm currently training her for IPO, which is kind of a new sport for me. We've done it off and on, but she's my first one that I'm really focusing on there. And then I have a young Rottweiler, Jax, who I'm also learning a new sport with him and just started doing agility with him. But yeah, they are more my relaxation training right now, so they don't get completely neglected from training, but it's kind of a new field for me as far as not being particularly focused and organized as I have been in the past with my own personal dogs. Melissa Breau: Right, and as I'm sure you have to be with the veteran dogs and stuff like that. Melissa Breau: How did you originally get involved in dogs and dog sports? Lucy Newton: My original getting involved in dog sports was getting a puppy when I graduated from college. I got an award when I graduated, for doing pretty well in college, and I promptly took that money, after paying for all of my college, and took that money and bought a puppy, and got into competition obedience just by the person that I found to take puppy training classes with. So I got a CD on that dog. But I had always been interested in search and rescue, and that was my main interest after doing competitive obedience for a while, selected a dog, and then went into search and rescue with that puppy. So I went from that competitive obedience into more of the working world and stayed in that world for quite a while, did search and rescue, got hired as a police officer, did my police canine work, and then at that point people started asking me to help them with their tracking, and that's where I got looped back into more of the sport world is that a lot of my friends were asking me to help them with hard surface tracking primarily, variable surface tracking, people that were doing competitive tracking sports. Melissa Breau: So the search and rescue stuff came before you were a police officer? Lucy Newton: Yes. I went into search and rescue and then went into law enforcement. And then, because so many of my friends were asking to help them with their tracking, I had been asked to do some clinics for sport tracking people. Then I felt like, after a while, it was fine when I was helping my friends, but when I started working with other people, I felt like if I'm going to be helping them try to achieve sport goals, then I should also achieve those sport titles. That was what really prompted me to pursue AKC tracking was I felt like I had an obligation to have those credentials and not go, "I'm a police dog tracker, so I should know about sport tracking." I felt like I should know what sport tracking really is and compete to that level. So that was what put me into sport dog tracking. Similar with the detection piece was I went from training detection into, as nosework developed, into working with more nosework people. Melissa Breau: You mentioned you got your start in obedience and search and rescue. Have you always been a positive trainer? If not, what got you started there? Lucy Newton: No, I wouldn't say I've always been a positive trainer. I think I always wanted to be a positive trainer but didn't really have the resources and the knowledge of how to do so. At the time that I got into dogs, my only resources were the people around me that were competing or training and working with dogs, and a lot of what I saw I didn't want to do, but I was in that position that a lot of us get into that we don't know what else to do. We know what to reject, but we don't know what we want to replace that with. That's sort of the evolution as far as becoming better trainers, I think, is finding those pieces of what we do want to replace that with. And of course once the Internet was available, that opens up access to a lot more resources. You have a better idea of which direction to drive to get to the people that you want to seek help from. But I have to say, for me, a big part of me evolving as a dog trainer, and definitely me becoming more of a positive reinforcement trainer, is my first police patrol dog that really forced me to do that. He was not a dog that responded well to force and compulsion. He was also not a dog that was going to respond well for me waiting for him to make good choices. So I had to become a smarter dog trainer because of him, and that was my biggest push into where I am currently as a dog trainer was by him basically forcing me to do so, so I'm exceptionally grateful for him for that. Melissa Breau: Kind of forced you to learn new methods and try new things and figure it out. Lucy Newton: Yes, and he was not going to respond to any of the … I wouldn't say bad training, I wasn't particularly harsh, but I had to just be a lot smarter. Inefficient training was not going to work with him. So he really forced me to … and I see a lot of that in both sport and work that there is a lot of inefficient training, and dogs are amazing and they figure things out, you know, sometimes in spite of us. This was not that dog. He was just going to keep following what his drive told him to do until I got to be smarter and figured out how to communicate with him. So that was really a gift to me as far as making me a better dog trainer. Melissa Breau: So, to bring things back to today, you do a lot of different things in your day job. Can you share a little bit about that? What does "work" look like for you these days? Lucy Newton: Work right now, like you mentioned earlier, is … a lot of it is focusing on the service dog program. That program, I take dogs that are either from shelters or other sources and train them for tasks, and then they're paired with veterans with PTSD. They're mainly dogs from 1 to 2 years old and from shelters, or we get green dogs from different resources, connections for detection trainers, so I sort of get some detection washouts, and then take those dogs, and really a big part of that training is the public access, taking them out and training them to go out in public. I also train them for some tasks. As service dogs, they have to have tasks that mitigate the veterans' symptoms. The tasks are not particularly complex, but a big part of it is the public access, and a lot of times I get dogs that come with various issues. There's a screening process that I do when I select the dogs, but like we all experience, even with our sport dogs, no dog is perfect. I'm still looking for the unicorn service dog that comes to me perfect. There's always something that needs to be worked on, and the big challenge as a trainer is deciding if I can fix that sufficiently so that dog can go and be a service dog for a veteran. In addition to that, like I said earlier, I try and get out with my own dogs and get in some tracking and Schutzhund training or whatever else I can do. But the service dog program takes up a lot of my time right now. Melissa Breau: At FDSA, though, you're mostly known for your tracking classes. I mentioned in your bio you started out in search and rescue. I think that's another piece that people are probably pretty interested in. Can you share a little bit about how you got involved in that, and what it is in that arena of dog training that captured and kept your interest? Lucy Newton: For me, like I said, I went in from competitive obedience, went into search and rescue. I always joked and said it was just an excuse to spend a ridiculous amount of time with your dog. It was basically the same thing as what we do with sports is you're spending a lot of money and time and effort on your dog. But in this case I felt like I could justify that because I was doing search and rescue, so there's some greater good there, and me, as a person, I felt like that was a good outlet for all this energy that I wanted to put into working with my dog, that if I could put that energy into the dog and have it do some good, then it was more reinforcing for me that way. As I say, I'm more of a training nerd than a competitor. 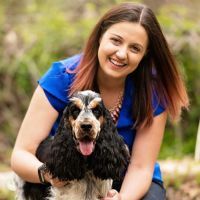 I like to compete with my dogs just so I have a goal that I want to work towards, and I'm kind of a perfectionist, so I want to do things really well, but the reinforcement for me is really the training part. That's more of what I enjoy, so that's where search and rescue really appealed to me, to just put that energy into something where there is a positive outcome towards it. Melissa Breau: How does training differ if you're training for search and rescue versus sports training? Does it? How similar or different are the skills the dogs actually need? Lucy Newton: Like I mentioned earlier, the dogs have the genetic ability to hunt, and how we define that hunting, we sort of parse that out into specific behaviors or tasks that we want the dog to do, like we'll discuss air scenting, where the dog is detecting scent on the wind versus tracking, where the dog is following the path of travel. But the dog with that genetic ability to hunt just uses whatever resources, whatever skills he needs, to be successful in the hunt. For training for sport, we want to focus more specifically on those behaviors that we want that meet the requirements for the rules for whatever sport that we're competing in. That level of precision, the style, how we want the dog to learn on the articles, all those are defined by the rules of whatever sport that we happen to be competing in. For actual work, search and rescue or law enforcement, you don't have quite as many restrictions on style. It's more the goal is to get the dog from the beginning to the end of the track and to find. I start all of my dogs, whether they're going to be sport dogs or law enforcement and search and rescue dogs, I start them all pretty much the same, and then I want to reinforce the behaviors for the specific skills that I want the dog to have. So if I want the dog to be focused more on IPO or Schutzhund-type tracking, I want to continue to give them tracks that are going to encourage a more careful, methodical, slower-paced track. If I have a dog that's more going into a track of search and rescue or law enforcement, I'm less concerned about speed. I want them to have more drive for the track. But those are just behaviors. Training tracking is just what behaviors I want to reinforce and continue to encourage the dog to bring to the sport or the work. Melissa Breau: It sounds like the sport is about taking that natural thing and refining it based on criteria, whereas search and rescue is a little more generalization and you just want them to be able to do the thing no matter what's going on in the world around them. Is that fair? Lucy Newton: Correct, correct. Yes, and now really with all the detection, whether it's tracking or scent detection, again we're training behaviors, what behaviors do we want to reinforce. Whatever the dog is doing that gets the reinforcement, the search and rescue and law enforcement dog is getting reinforcement by finding that person on the end, so whatever skills they use to get there, then that's what we're reinforcing. The same thing for the AKC or the Schutzhund dog. They're finding articles and they're getting reinforced for finding the articles. Whatever skills they brought to the task that resulted in that success, that's what they're going to do. So that lets us … as trainers, that's where we can manipulate the environment and adjust things so that they're doing the behaviors that are getting the reinforcement that they want. Melissa Breau: I know you've got your Foundations Tracking 1 class coming up in December, followed by your Alerts - Developing and Problem Solving and Tracking 2 classes in February. Can you just share a little bit about what each class covers and maybe who might be interested in taking them? Lucy Newton: The Tracking 101 class, which runs twice a year, it's a little bit of a challenge with the Academy tracking classes because we have such a problem with the weather. The weather does not cooperate, so half of the world is happy and the other half is not happy at any given time with the tracking conditions. So we try and offer the 101 class in December and April to allow people that, you know, in April some people are still under snow, or in other parts of the world it's too hot. And then further in the South, as you continue on with the tracking training, then you get into June and July get too hot. So we try and present this December one for people that have relatively … not completely mild winters, but their weather is OK for tracking. Lucy Newton: Not going to guarantee that it's not going to be cold. Melissa Breau: Right, but not buried in snow. Lucy Newton: Yes, you won't be under snow. So that's why we added this December class, for people that are in more temperate climates that could get some tracking done during what is winter for most of us. It's a basic class. It starts out, like I said, with puppies, and green adults. It assumes no skills. The dog doesn't really have to know anything, because again, they already know how to track. We just want to turn that switch on and let them hone a skill that they already have. So we start out right from the beginning. We do get a fair number of people that come in that want to improve foundations. Some people have had problems with turns, so some people elect to go back through the course and just build up the foundation behaviors too. Melissa Breau: Plug any holes that they have in their training. Lucy Newton: Correct, yes. And then the February class is the 102, which is a continuation of 101. They work really well together. It's a little bit tight to get a lot done in six weeks, but with that 102 track, that gets people headed pretty well in the right direction. So again, I offer that in February so people can jump in and take more advantage of more temperate winters. Melissa Breau: And you've also got the Alerts class, right? Developing and Problem Solving. Alerts? Lucy Newton: Correct. That came about from part of my nosework training is people wanted to train doing a trained alert for detection, which most detection, at least at the NSCSW and AKC, you don't have to have a specific trained alert. When I was working detection dogs, we had to have some kind of response that the dog had that was their consistent behavior that they did. My drug dogs did either sit or down, and that was an unprompted sit or down was their alert for detection. The nosework doesn't really require that. You can just sort of read the dog and interpret through their body language or whatever behavior that they're naturally doing that they're at source. Sometimes people want to train at alert, so that is where the class started from was for those people that actually want to train in alerts, this is the process of how you might do that. There's pros and cons to training alert, but that would be a whole other podcast. Melissa Breau: Fair enough, fair enough. So you're telling me you have to be back! Lucy Newton: Correct! In this case, that was what started the Alert class. But what it has evolved to is it's become a lot of problem-solving for alerts. Either dogs that are too destructive, dogs that are too subtle, problems with what kind of natural body language are they presenting that we can read and how can we enhance that. A big part of it is fixing the destructive dogs that are just smashing boxes or smashing hides. It's a really fun class. I enjoy it from a training nerd standpoint. It's a really fun class from the problem-solving aspect of it, of going back and fixing behaviors that have been reinforcing, such as box smashing, how to go back and give the dog a new behavior and give them a new way to alert. So it's a fun class if you're a training nerd, but it's a fun class for that too. Melissa Breau: The way I end every episode when I have somebody on for the first time is with these three specific questions, so I wanted to go through those. The first one is, what's the dog-related accomplishment that you're proudest of? Lucy Newton: That's a hard question for me. You gave me the warning that it was going to be a question, and I still don't have a good answer. I guess I would say probably my second search and rescue dog, his first actual search that he did, we found somebody who was missing. So that in itself, when you look at it, think, Well, that's a pretty big accomplishment. But, for me, it was not so much that actual success, which was great, I mean, for that person, but it came about through some behaviors that were pretty subtle on the part of my dog that I read and adjusted what I was doing, based on the information that he gave me, and then it was successful. So that is more the accomplishment for me. And I have a similar one for my detection dog that … we found a whole lot of drugs, which is really cool and makes for a good picture, but it was more the "I wasn't so stupid that day." I actually read my dog and knew what they were telling me, and then it had a good outcome. Looking back at it, those are the pieces that stand out in my mind, rather than the thrill of being successful. Melissa Breau: That's kind of neat, actually, because it becomes about the relationship, knowing that you know your dog's body language and you know how to read them, and that's kind of a neat thing. Lucy Newton: Correct, because in both cases, both with the detection and search and rescue, I think back, and if I had not read that information, then those would have had totally different outcomes because I would have not made the choices that I did. With the search and rescue dog I actually went outside of where I was assigned to work, based on my dog's behavior and what they were telling me. And the same thing with the detection dog is that I again searched in a different area, based on the information that he was giving me. So in both those cases I look back and go, "If I had not stopped for a minute and went, 'I wonder why he's doing that,' then those would not have had the outcomes that they had." Melissa Breau: That's really neat. My second question here: What's the best piece of training advice that you've ever heard? They each get easier, right? Lucy Newton: Oh yeah, exactly, so much easier. There's a couple that stick in my mind. But really, it was… I'm totally a dog-training nerd. I just have all these little pieces. But really what I find that I use daily, across all of the venues that I do, and that's where I have been really fortunate, because I have had the ability to generalize training just because I've had the opportunity to be involved in so much of it. And whether I'm teaching … I'll get back to your question … whether I'm teaching sport dog people or law enforcement or the veterans with their service dogs, I'm saying the exact same things. I don't say anything different. I might present it differently so it applies specifically to what that person's trying to do, but my basic tenets of dog training, I'm saying the exact same thing over and over, regardless of who I'm working with. Melissa Breau: Hey, that's our audience. Lucy Newton: Yes, exactly. It really solves a lot of my own problems when I stand in my training room and go, "That's not what I wanted." I always look to the direction that I'm rewarding the dog, where am I placing the reinforcer. So that was a real big piece, and I think probably a big part of that was attending some of Bob Bailey's lectures. That really cleared that up for me as far as that being an important part of my training process. But it's really hard to pick one. Maybe that's not so much the best. Maybe that's where I'm weakest at, so I have to keep reminding myself. I'm not certain. That could be it too, because I scratch my head and then go, "Well, look where you're rewarding the dog." So it could be just my flaw as a trainer, I don't know. Melissa Breau: Obviously not, if it's the advice you give out, too. Clearly you're not the only one. Lucy Newton: Correct. That could be. Melissa Breau: Last one here: Who is someone else in the dog world that you look up to? Lucy Newton: Again, another hard question. So, I've been "in dogs" for a long time, and I'm not by personality, either, sort of, never be, like, the fan girl, so I get so much from so many people. I guess probably for me the big thing was having worked for Randy Hare. That's really so much of what we learned, what we were doing with our detection dogs, that I apply to everything. My current style of training tracking is really his system of detection dog training just modified to train dogs to track. reinforced for the behavior that you want. That was such a big piece of my education as a trainer, so I would have to say from that point I've been really grateful for him. So that would be part of that, he would be one person that I would point to, just because I'm training service dogs that way, and I'm training detection dogs, whatever I'm doing, I'm doing it with that same system of "These are amazing, intelligent animals that can do the task. We just need to explain to them what we want." Melissa Breau: All right. Well, thank you so much for coming on the podcast, Lucy. This is great. Melissa Breau: Absolutely. And thank you to our listeners for tuning in! We'll be back next week, this time with Chrissi Schranz to talk about fitting training into a busy schedule.